Details are everything! Create the ultimate dining experience with Wildwoods meat carving station. 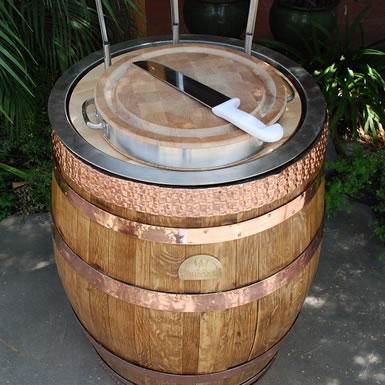 Fashioned from fine French oak barrels, hand hammered and tooled copper banding adds a touch of class.Includes stainless drip tray and custom meat display cutting boards. Wildwoods Meat Carving Station is made from premium French oak barrels that have been meticulously refinished. Hand hammered copper accent bands contribute to a refined and timeless look. Our carving station features a stainless steel drip pan that sits in the head of the barrel. From there we install a premium John Boos carving board that contain special skewer holders. Perfect for displaying succulent cuts of meat to eager guest.